Charles Capps travels and ministers throughout the United States, sharing from practical, first hand experience how Christians can apply God's Word to their life and live victoriously. 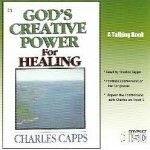 Charles Capps has authored more than twenty books including the bestseller, The Tongue, A Creative Force. Charles Capps and his wife Peggy reside in England, Arkansas.